Tonight the Exeter Fire Department held a special practice involving the Dashwood and Huron Park Fire Departments. 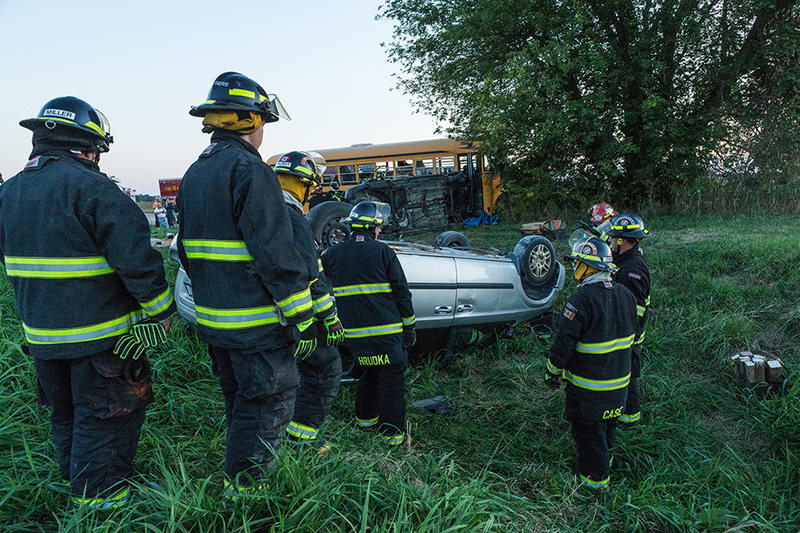 District Chief Jeff Musser and his colleagues had set up an accident scene with donated vehicles arranged to provide multiple training opportunities. 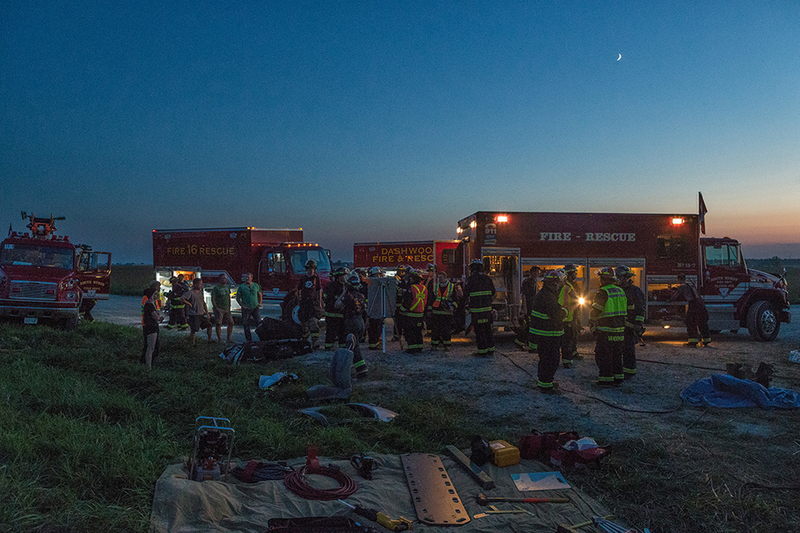 Volunteers were arranged inside the various vehicles and acted as ‘patients.’ When all was ready, the first call was made to the Exeter Fire Department with subsequent calls made to Dashwood and Huron Park. 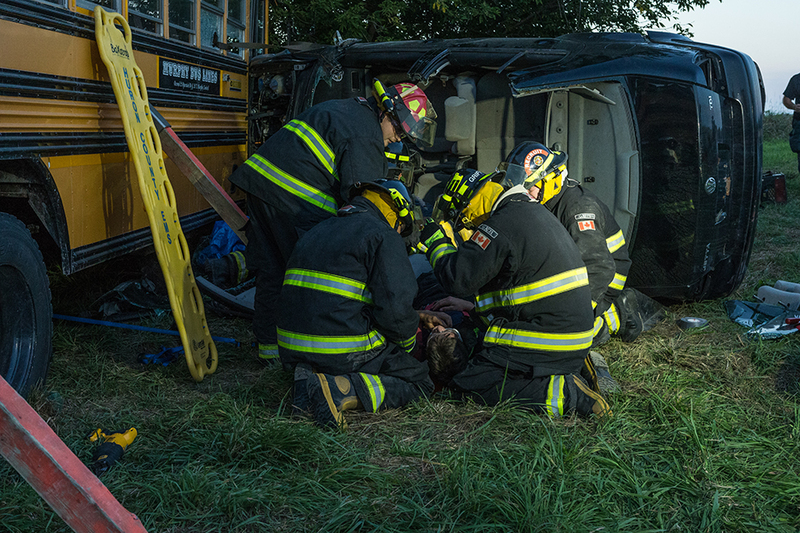 On arrival at the scene, firefighters were met with a school bus accident involving three other vehicles, numerous ‘patients’ with injuries to assess and challenges that changed on the fly. The scene was calm and measured as the firefighters set up their perimeter, laid out their equipment and prepared for all eventualities. Incident Commander Michael Reid assigned teams to assess each section of the scene and, with plans made, the task of extracting the ‘patients’ began. Sometimes the plan worked while on occasion, the plan needed to be altered as other factors came to light and required a shift in direction. Windows were carefully removed, the jaws of life employed and roofs ripped off along the way but everyone was removed from all four vehicles within 40 minutes. We’re very fortunate to have volunteer firefighters in our community who are diligent about their training and dedicated to keeping all of us safe. Various training exercises have taken place in fields, up Trivitt’s bell tower and in donated houses about to be demolished among other locations. 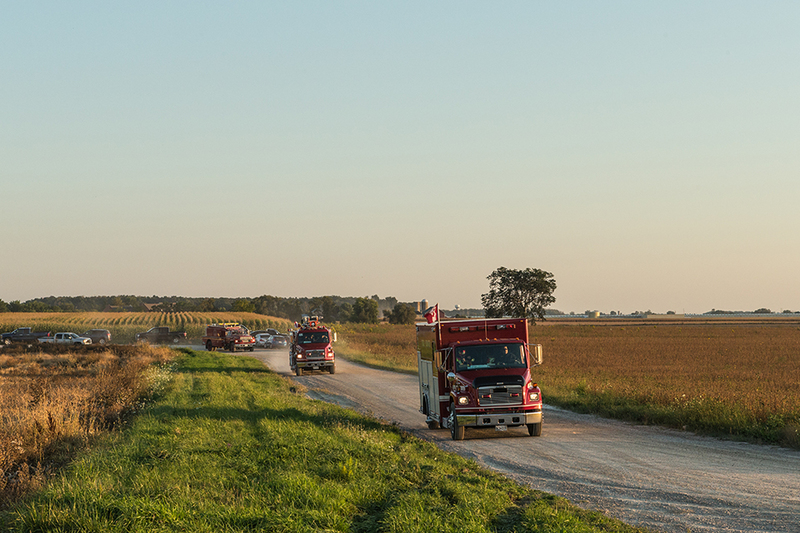 If you see a green flashing light, don’t forget to move over – a firefighter is on his or her way to save a life or property.